(Q) Are T-Shirts in stock at all times? (A) No. We only stock blank shirts and each shirt is printed on demand. This allows us to offer an unlimited number of designs without having to stockpile shirts with designs that may not sell as often as others. Our printers process shirts and other apparel during normal business hours Monday through Friday. (Q) Can I use more than one coupon code per purchase? (A) No. Only one code works per shopping cart. Please, be advised that shopping carts exceeding $59.00 will have a greater discount using the 10% off code, rather than using the free shipping code. (Q) I've noticed that some shirts show other styles like Ladies, V-Neck, Hooded Pullover, etc. and other shirts only show the Standard option. What gives? (A) Not all styles are available in every color, but all styles are available in white or black. If you want to see other styles, first select white or black as the color, select the style and the color options for that style will appear. We wanted to make the site colorful, so we uploaded the items with various colors. Unfortunately, this makes it appear that a particular shirt is only available in one style. (Q) What brand of shirts do you use? (Q) Do you print custom designs that we've created? (A) Yes. If you have artwork, we can upload it and make your design available for print on our shirts. Keep in mind, we have a variety of colors and some designs don't work well with certain colors. In that case, we can make your design only available on certain colors and you have the option of creating a second design with colors that work with colors that won't look good on the first design. (Q) Are there specific requirements for submitting artwork? (A) There is a maximum size of 11 inches x 15 inches or 2,200 pixels x 3000 pixels with a DPI of 200 to 300 and a maximum size of 10 megabytes. (Q) Can you design artwork for us? (A) We will try to create your design suggestions, but can't guarantee we will capture exactly what you have in mind. We understand that the perfect fit is always the best fit. 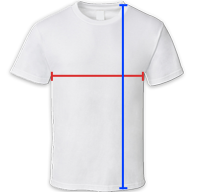 In order to help communicate with our customers, we believe it is important to provide a sizing chart to help your decision making easier. The sizing chart is accessed via a hyperlink just above the add to cart button. Please note: Not all styles are available in every color, but all styles are available in white or black. If you want to see other styles (Ladies, Men's Fitted, V-Neck, etc. ), first select white or black as the color, select the style and the color options for that style will appear. We wanted to make the site colorful, so we uploaded the items with various colors. Unfortunately, this makes it appear that a particular shirt is only available in one style.